The good news is there are more healthy snack options in convenience stores, airports, train stations and big-box stores than ever before. When I’m on-the-go, however, I like to make sure I have my “go-to” options tucked safely in my handbag/tote bag/carry-on. I admit it – I’m picky. 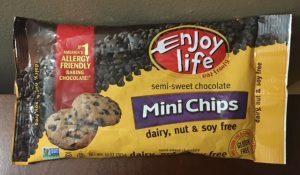 I want gluten-free, vegetarian, dairy-free snacks, but I don’t always like some of the ingredients included in packaged products. It’s not that they are not healthy, it’s just sometimes the taste and/or texture doesn’t agree with me. 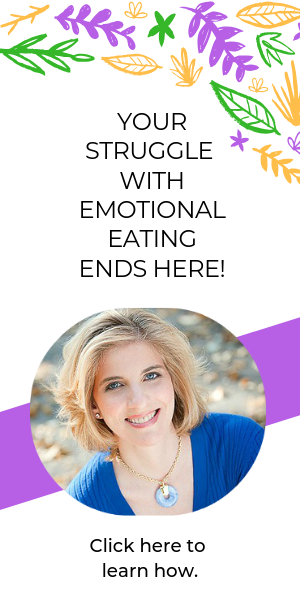 Most importantly, I want to make sure emotional eating triggers don’t take over. When I’m hungry, heading to a meeting, stuck in traffic, waiting at the airport or train station, my mind may wander and worry. I do have my stress management tools that I use, and I want to be sure I have my comfort foods close by to satiate my hunger and calm by anxiety. 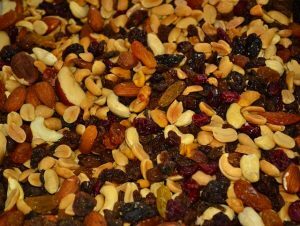 Make your own trail mix before you leave home. Add what you like – almonds, pumpkin seeds, cashews, sunflower seeds, raisins, hazelnuts, walnuts…what else? Well, I like to add a few chocolate chips. I like the Enjoy Life brand. Although there is some sugar in the chips, there is no dairy and no soy. 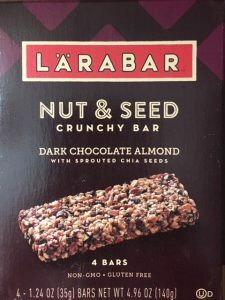 I’ve liked Larabars since I started on my wellness journey. I recently found these nut & seed bars. They had me at “sprouted chia seeds” on the box cover. I bought this box at Target – so healthy eating doesn’t have to be expensive. 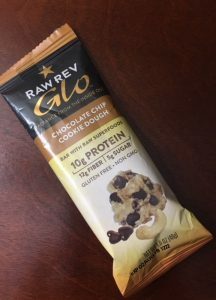 I can’t remember when I first discovered the Raw Rev Glo bars, but I’m glad I did; especially these chocolate chip cookie dough bars (yum!). With 10 grams of protein and 12 grams of fiber, Raw Rev bars can be a filling, healthy snack while stuck in traffic, before a holiday party (to avoid picking on all of the “empty calories”) and on a long plane ride. As I said, more healthy options are available outside our homes – apples, bananas and other fruit are sold at airports, train stations, Starbucks, convenience stores, etc. To up the nutrition ante, I often carry an almond butter packet. It’s easy to smooth on a piece of fruit and instantly add some protein and healthy fat to my snack. I like the Artisana brand because it doesn’t add any oil or sugar to its basic nut butter packets (read ingredient labels carefully). What do you like to eat on the go? Do you pack snacks when travelling?